The top 10 states for renewable-energy job announcements in 2014, the number of estimated jobs and number of announcements for each. WASHINGTON – Arizona had the fifth-highest number of clean-energy jobs posted in the nation in 2014, driven by strong numbers in the first half of the year, according to a report released Thursday. The report by Environmental Entrepreneurs – which does not track actual hiring but the number of renewable-energy job announcements instead – said Arizona companies announced plans to hire 3,402 last year, out of nearly 47,000 nationwide. “Arizona is always in the top of the stack with renewable jobs because we do have a diverse energy portfolio,” said Susan Bitter Smith, chairman of the Arizona Corporation Commission. Almost all of the jobs estimated for Arizona were solar-energy related, with most of those coming from the planned Solar Wind Energy Tower in San Luis, which could create 2,350 jobs, according to its backers. If built, it would be the first hybrid solar and wind energy technology on the market, developers said. The tower would mist desert-heated air at the top of the tower, cooling it and forcing it naturally down, where it would rush past turbines at the base, generating electricity in the process. The location in San Luis – with its plentiful sunshine and subsequent hot desert air – is key to the operation of the tower. Other Arizona jobs that made the report were more traditional solar-array construction jobs at Davis-Monthan and Luke Air Force bases. On top of the rankings was Nevada, which got credit for 8,591 jobs, about 6,000 of which were tied to Tesla Motors planned “Gigafactory” to build batteries in the state for the electric car manufacturer. New York got a large boost from a proposed solar-cell factory in Buffalo that could create 5,000 jobs. California didn’t have any one large project, but still finished between Nevada and New York. All of Arizona’s renewable-energy job announcements came in the first half of last year, with none coming after June. That early surge was still enough to land Arizona in fifth place for the year. 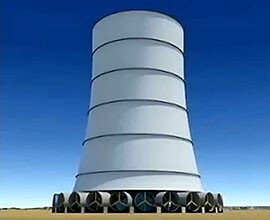 Expected jobs at the proposed Solar Wind Energy Tower in San Luis, shown here in a rendering, is responsible for most of the planned new jobs in renewable-energy industries in Arizona in 2014, a new report says. Photo by Solar Wind Energy Tower Inc.